You need a sidekick when things get slick. If April showers are on the forecast, make sure you’re equipped with dependable workwear that will keep you dry and functioning at the top of your game. 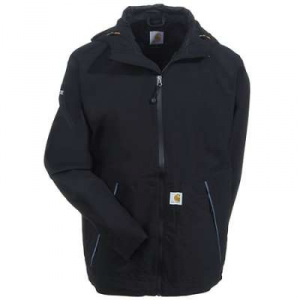 At Working Person’s Store our selection of Carhartt rain jackets will give you the wet weather protection that you need when rain clouds come your way. The Carhartt brand offers consistent quality gear that will elevate your work wardrobe with its classic style and rugged features. If you’re caught outside in the rain, you’ll appreciate the lengths that the quality obsessed Carhartt brand took to ensure the Carhartt Men’s 100100 300 Surrey Rain Jacket will keep you dry. They crafted this piece from mid-weight 50-millimeter polyester-backed PVC and included electronically welded seams for seal out moisture. They also engineered a double-front storm placket with inside and outside protective flaps so you won’t have to worry about the elements creeping in on you while you work. The interior neoprene cuffs with adjustable hook-and-loop closures and detachable hood will shield your arms and head from unwelcome wetness. Not only is this piece functional and protective, it’s also long lasting and includes reinforced elbows and major seams that have been sewn and welded. For the full ensemble, grab a pair of matching Carhartt Men’s Green 100101 300 Waterproof Bib Overalls. While this jacket is a master at blocking the rain, the PVC material is not considered breathable so if you plan on working up a serious sweat, you may want another Carhartt rain jacket with a breathable membrane (see below). If your line of work has you outside performing less physically demanding tasks—like delivering packages or surveying—this jacket should be your go-to piece for when the rain clouds roll in. You’d probably trust a recommendation from a coworker on great gear for the job. They know the challenges you face and what features you need. That’s the beauty of Carhartt’s field testing initiative—it lets real-life laborers use apparel to ensure its quality and relevance. The Carhartt Men’s Black J162 001 Waterproof Breathable Jacket aced the test. The water-repellant finish will keep out every last drop of water. You’ll thank us when your coworkers are drenched and you’re feeling fine. Unlike traditional rubber rain coats, this jacket is made of a durable nylon with a breathable membrane that allows your body heat to escape while keeping out rain and moisture. The contoured three-piece hood will keep your head protected from any downpour with its adjustable draw cord. Giving you an added line of defense against the elements, this outerwear favorite includes a hem with an elastic draw cord. Because of its breathable membrane, this waterproof jacket is perfect for any job where you’ll be exerting a lot of energy and sweating. 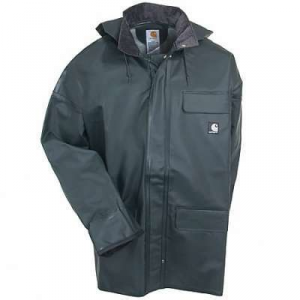 If you work in forestry, landscaping or construction—or any other rugged industry that calls you outdoors—this jacket will keep you cool and dry at the same time. Do you ever work up a sweat on the job? We thought so. 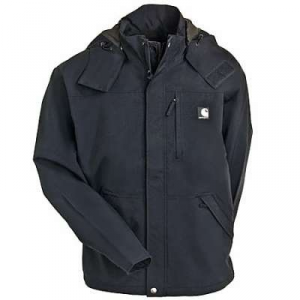 That’s why we love Carhartt’s 101089 001 Men’s Black Lightweight Force Equator Waterproof Jacket. Made from durable nylon material, this jacket works double-duty to keep you protected from the rain and give you breathable, lightweight comfort. The Storm Defender waterproof, breathable technology prevents precipitation from penetrating the material but lets sweat escape from the breathable membrane. The fully-taped waterproof seams block wetness. The Fast Dry technology works to wick away your sweat and the Force technology fights odors—something your coworkers will appreciate. No kid-gloves necessary when wearing this jacket—its nylon material is abrasion-resistant and designed to take on oil and many chemicals. Like the Carhartt J162 jacket, the Force Equator is great for any job where you’ll be exerting a lot of physical energy and sweating. In addition, this jacket is resistant to oil and chemicals, making it perfect for anyone working in landscaping or around machines. Visit WorkingPerson.com to view our full selection of Carhartt rain jackets and all other gear you need to conquer your work day.